One of South Africa's most iconic images, Table Mountain, with its flat plateau top dominates the Cape Town skyline. 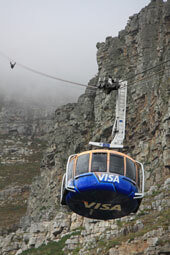 The Table Mountain National Park lies at the top of the mountain. Here you can view the city laid out before you far below. Getting to the top is easy if you take the cable car although extremely fit people also walk up to the top. The National Park is extensive so do wear good comfortable walking shoes. Apart from superb views there is the rocky surface with a richness of plants (mainly fynbos) and animals. Paths have been developed to create a fairly level walking surface. There are also cafes and toilets. Creatures that you may spot are lizards, rock rabbits (rock hyrax) commonly known as dassies. small snakes, mongoose and tortoises. There are also many birds including humming birds with a metallic sheen to their brilliant coloured plumage, which appear to hover in mid air and the cape francolin which is also present on Signal Hill. 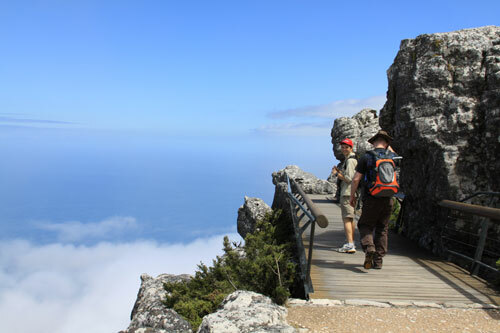 Table Mountain is a magnet for hikers who walk and climb the numerous trails. There is also abseiling and windsurfing. The cable car does not operate in windy weather. Best to check before you go. If the top is shrouded in cloud it's like walking through dense fog.